Where did that noise come from? The ability to estimate distances to sound sources accurately can be crucial for survival. A new study carried out under the direction of Professor Lutz Wiegrebe at the Department of Biology at LMU sheds light on a novel mechanism that is employed by humans to estimate their relative distance from sound sources. The investigation reveals that humans can perform this task more efficiently when they are allowed to move. The findings are published in the Proceedings of the National Academy of Sciences (PNAS). “We humans find it difficult to assess, either visually or acoustically, how far away an object is from us,” Wiegrebe says. “Our visual system makes use, among other things, of the phenomenon of parallax. When we move, the apparent position of an object that is closer to us moves more within our visual field than an object located further away. This relative motion provides information about the relative distance of the two objects. Localization of sounds is particularly challenging when the nature of the sound source is not clearly defined. It is not that difficult for us to estimate our distance from a speeding ambulance when we hear its siren. But when the sound is unknown, we cannot tell whether we are hearing a faint sound close by or a louder sound further away. 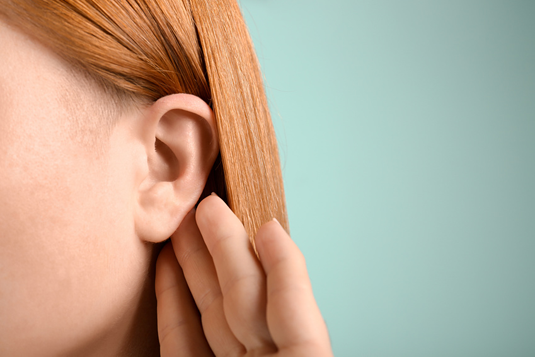 Wiegrebe and his team set out to determine how our hearing system copes with this situation. The experiments were carried out in a non-reverberant chamber to ensure that the participants could not assess relative distances from the locations of sounds on the basis of echoes or reverberation. The experimental subjects wore blindfolding goggles and their head motions were monitored. They were seated facing two sound sources that could be positioned at different distances from the subject. One of the sources, chosen at random, emitted high-pitched and the other low-pitched sounds. The subjects’ task was to determine which of the sound sources was closer to them. “Participants who moved their upper bodies sideways – so that the sound sources were further to the right and then further to the left – were better able to estimate the distance between the sound sources. This result demonstrates that humans can use auditory motion parallax to estimate relative distances from sound sources,” Wiegrebe points out. In fact, subjects were able to do so even when the distance difference between the two sound sources was only 16 cm. As the study shows, humans make readily use of auditory motion parallax associated with self-motion to localize sounds. “However, with practice, it is also possible to improve one’s perception of auditory parallax.” Whether or not other mammals exploit auditory motion parallax is not yet known.